Well, it’s finally here. 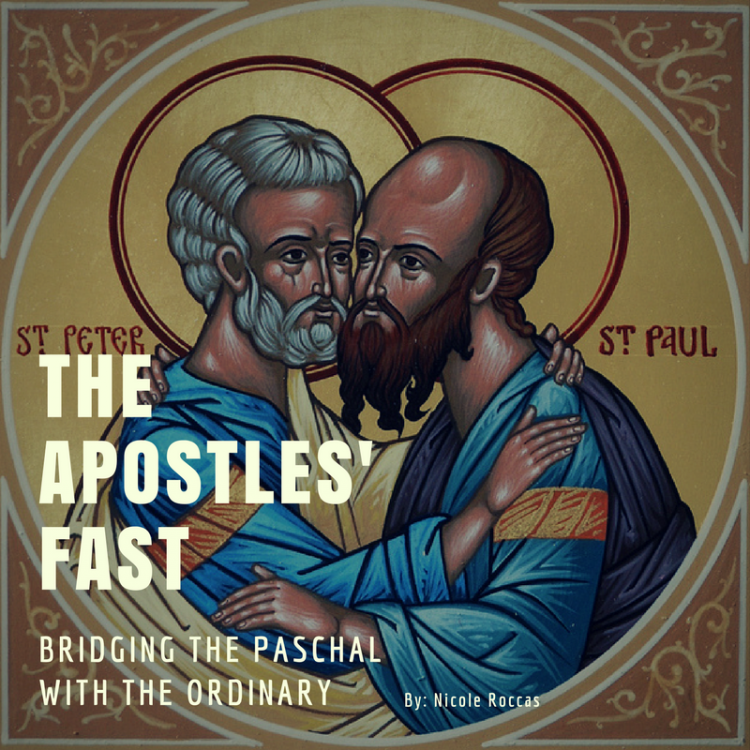 We’re in the thick of the Apostles’ Fast–a fasting period that begins the day after the Sunday of All Saints (the Sunday immediately following Pentecost) and culminates in the feast of Sts Peter and Paul (June 29). The fast goes back at least to the fifth century, and probably a bit earlier (there are allusions to St Athanasius mentioning this fast during the fourth century, but I myself haven’t found the primary sources for this). It’s also likely that originally, the Apostles’ Fast was not tied to the memory of the apostles, but observed instead as a sort of post-Pentecost fast–an ascetical counterpoint to the long, generally festal period of Pascha. The Orthodox Church doesn’t have ordinary time as such. After Pascha, we do start numbering our weeks anew–but we do this according to each week’s proximity to Pentecost. Last Sunday, for example, was the Second Sunday after Pentecost, not the Second Sunday in Ordinary Time. Thus, our temporal reference point is always a salvific event–Pentecost, in this case, which is itself a moveable feast pointing back to Pascha. Many people hear the term “ordinary” time and falsely assume it means that this chunk of the year is not as important or interesting as the Advent or Easter seasons. I’d like to think that in the Orthodox sphere, we are immune to this kind of reasoning. For one thing, we have a hefty dose major feasts that interrupt this so-called “Ordinary” duration: the Transfiguration (August 6), the Feast of the Dormition (August 15), the Birth of the Theotokos (September 8), to name a few. But I’d reckon that despite these feasts, and despite the fact we don’t call this season “ordinary time,” this is the time of year when we will begin to feel time’s ordinariness. After all, we still number these Sundays, and the numbers will go on and on–all the way until the Triodion season (in 2018 this will fall on Jan 21 or 28, depending on whether your jurisdiction observes the Sunday of Zacchaeus or not). Some years, this can last up to thirty-two weeks. That’s thirty-two weeks of counting, reckoning, trying to remember how long it’s actually been since we did that Pascha thing. If you use a lectionary in your daily prayers or Scripture readings, now is the time of year you brace yourself for the long haul of Pentecost time. And if you’re like me, in one or two or three months you will start getting all the weeks mixed up. Is it the eighteenth week after Pentecost or the twentieth? Or the nineteenth? And you will keep having to pause partway through your prayers and look up the proper week on your smartphone, its glare consuming the candles that flicker against the creeping darkness of autumn and winter mornings. And it will all start to seem a bit contrived and inorganic. Arbitrary. Like the numbers on a clock. Maybe on those mornings–those mornings when the thirtieth monday of Pentecost seems just as plausible as the twenty-fifth–time will seem ordinary. Not in the Latin or liturgical sense of the word, but in the boring sense. In the plain sense, the unadorned sense. In the sense of slow, barely moving mundanity. Or maybe you don’t use a lectionary, but nonetheless face your own seasons of ordinariness. The times in life when you’re just marking the days, just trying to find some indication that you’re moving forward at all. During the Apostles’ Fast, I like to soak up encouragement for those staggeringly ordinary times. This particular fast occupies a strange (and in my opinion purposeful) position in the Church calendar. As I’ve pointed out in my infographic on the Church calendar, the Apostles’ Fast begins on a moveable date but ends on a fixed one–it’s the only fast that spans the chasm between fixed and moveable liturgical cycles. I see this as a bridge between Pascha and the ordinariness of post-Pentecost. The fast gives us pause to just be in this in-between space, holding paschal time in one hand and fixed, numbered time in the other. And then it tells us to go forth, to follow the example of the apostles as we proceed into this next temporality. This is our gentle, liturgical nudge that there is work to do, and that sometimes the work will be long and mundane. We are turning our gaze that has been focused backward on Pascha and redirecting it to the present–be it the first, second, or thirty-second week of the present. And in taking these first steps into the new, ordinary season that stretches before us, we find that we–like the Apostles’ Fast itself–are also a kind of bridge, called to join the Holy Resurrection with all that is ordinary in this world, to whisper eternity into mere chronology. We are called to stand on this endless shore of Christian witness, with one foot in fixed time and the other in the journey of Pascha, and to keep on standing that way for as long as God gives us breath to live. At no other time do we see this aspect of our being manifested more than during the Apostles’ Fast, which on all liturgical levels calls us to live in two times at once. This is why I like to say that the Apostles’ Fast is the most time-eternal of all the fasts. This is why it’s my secret favorite of all the fasts. But let’s keep that between us, if you don’t mind. I wouldn’t want to hurt the feelings of Great and Holy Lent. Beautifully written. I must confess that I have never been a fan of the Apostles’ Fast, though once I have began I realize how much I need this discipline after the feasting of Pascha. Now, I will see it in a new light. I love the imagery you used when you spoke of trying to find the proper week of Pentecost during prayers. When I am searching this fall and winter, I will recall this passage and, perhaps, think a bit more fondly of the Apostle’s Fast. I know a lot of people that don’t like the Apostles’ Fast 🙂 Up here in Canada, it falls smack dab during the very short period of time that is suitable for grilling! Personally, though, I like it because it is so short. I can lean a bit heavily into the fast than I would be able to sustain for the longer duration of Great Lent or Nativity. 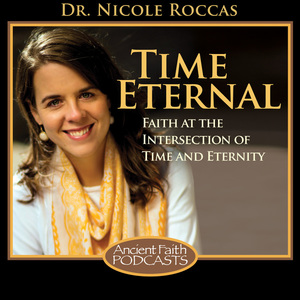 Thank you Dr. Roccas for this piece – it is very useful to know more about the unifying effect of this short(er) fast between the “fixed” cycle and the Paschal cycle. (after checking out the calendar infographic I have to look back somehow to see if there were years when we actually did not have an Apostles fast?) I am thankful to think now about this Apostles’ Fast that it has this uniting flexibility (like an accordion, stretched on one hand 😉 and offers us the opportunity to “be”, and be thankful in this special time. I love the image of an accordion–that’s a perfect way to describe it!